If this blog were a film production this record would be a sneak preview, a coming attraction, an early trailer. Call it what you will, but contained within is our first meeting with Joseph Vernon Turner… Big Joe himself… and over the next decade it’ll be Turner, as much as anyone really, who will sort of provide rock ‘n’ roll with its musical compass. Since this is our introduction to Turner here on Spontaneous Lunacy I’d be remiss if I didn’t offer a somewhat perfunctory sketch bio of one of rock’s most legendary singers. Truthfully it should be unnecessary, for even the most casual rock fan should rightfully know of the career and legacy of a giant like Turner, but sadly we’re all too aware that what SHOULD be is rarely so when it comes to rock history. Therefore, for those who DO know, indulge me for a minute to bring everyone else up to speed in abbreviated fashion. Turner was born in 1911 in Kansas City, one of the most fortuitous convergences of an individual, a locale and an era that could ever be drawn up. Kansas City was a notoriously wide open town at the time, openly corrupt in ways which in retrospect seem colorful and harmless. (Local boy Harry S Truman, who was residing in the White House in fact when this song we’re covering was released, came up through the political machine of Missouri at the time, one rife with sordid underhanded connections that helped propel him up the political ladder). It was a city where liquor flowed freely during prohibition and where the jazz age of the 1920’s got an early start and stayed up way past its bedtime, even as the rest of the country had mellowed a bit in the decade that followed. It was in that environment Turner came of age, dropping out of school at 14 to work in a saloon as a singing bartender, his age belied by his size – 6’ 2” and well over 200 pounds then, eventually over 300 as an adult (for our British readers who measure weight by stones and pebbles, Turner was a boulder!). His musical cohort in these local establishments was pianist Pete Johnson, one of the foremost boogie woogie stylists of all time (and who we first met on these pages back in December on Crown Prince Waterford’s Move Your Hand Baby) and together Pete and Big Joe formed a dynamic pair. While tending bar Turner would break into song at the slightest provocation, Johnson picking up the tune on the keys while the drunken patrons whooped it up with delight. If time travel ever becomes possible make sure to set the dials for the late 1930’s and stop in at any of the clubs on Vine Street for a helluva good time. Bartending was never Turner’s goal in life, merely a means to an end, a venue to sing for a captive audience, and soon both he and Johnson were propelled to the national stage when legendary musical talent scout/folklorist/producer John Hammond recruited the duo to New York to take part in the groundbreaking From Spirituals To Swing concert at Carnegie Hall, meant to showcase to white society audiences the rich and varied black musical forms that existed at the time. The two promptly stole the show. Johnson’s barrelhouse piano playing, backed by Turner’s impressive blues shouting with a voice so deep, expressive and resonant than microphones were hardly needed, kick-started a nationwide boogie woogie craze. Following the concerts they took up residency in New York at the Café Society, oftentimes with two other piano playing giants, Meade Lux Lewis and Albert Ammons, billed along with them and promptly set the town afire. Roll ‘Em Pete was the pair’s signature number, a loose collection of Turner’s verses and Johnson’s ferocious playing, one of the most crucial pre-rock tracks for a number of reasons, not least of which was the prominent backbeat that hinted at things to come. The pair seemed on their way to dominating the 1940’s music scene. But then something got in the way. A xenophobic German runt with a funny little mustache and a giant inferiority complex started an international ruckus after his house painting career flopped and World War Two stole the spotlight from Turner and Johnson. By war’s end in 1945 the two were still making a go of it, sometimes together, sometimes separately, but whatever momentum Big Joe had built up before the fracas had long since stalled and while he’d actually score his first charted hits at this time, once newer forms of black music began getting some attention for their commercial clout by the powers that be he’d wind up spending the next few years in search of the key to start it up again, which is how we come to meet him here – not as a star, but as a somewhat struggling musical vagabond. 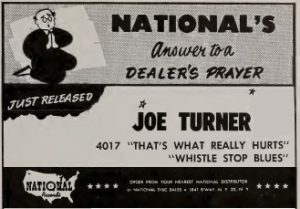 Turner’s versatility, not just as a singer but as a songwriter, theoretically gave Big Joe a leg up on competitors as the styles changed around them after the war. Though he’d be billed as “The Boss Of The Blues”, he was never what could be called a true blues singer, or at least how the blues came to be thought of in the years to come. He’d have good success with downhearted laments, for few singers could convey as much internal gravitas in a lyric as Joe, but he generally preferred the band to be jumping so he could do what he loved best, roar along to uptempo rockers. In essence, though it took until 1947 for the sound itself to be crystalized and combined with a larger cultural shift that gave it impetus, the basic musical framework rock was built from in the first place had been established by Big Joe Turner to begin with. His record from the spring of 1947, Sally Zu Zazz, was rock in all but name and he’d been singing in that vein – or something reasonably close to it – for years. It just took awhile for everyone else to catch on and catch up. But catch up they did and once rock hit like a ball of fire it was ironically Turner who was slow to jump on board. Though Turner was busy throughout 1947, cutting for a variety of labels, more often than not he was simply rehashing what he’d already done in more definitive fashion earlier on, often in a much more restrained approach. So here it is, a full seven months after rock’s birth, where we meet up with Turner at last, just as it seemed the train was about to pass him by completely. By this time Turner was gone from National Records, one of his two longer lasting associations in the 40’s (the other being Decca), but they still had some sides left in the can and considering this was recorded awhile ago it’s altogether appropriate that this would mark his debut in the rock field, as it’s essentially a dry run through what would become one of his most exuberant rock songs, 1950’s Adam Bit The Apple. 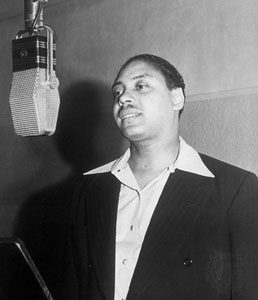 The lyrics are near identical (Turner wrote them both after all), while the concept itself, at least in this rendition more so than Adam – combining a sad storyline (albeit with some bravado thrown in) and an ebullient track would be something that would pay great dividends in the future and Motown for one, Holland-Dozier-Holland in particular, would mine to great effect with The Supremes, Four Tops and others. Turner, of course, beat ‘em all to it, and though he showed up a little late for this party, keep in mind he more or less had written the invitations for others to come long before the little tyke called rock ‘n’ roll had even been born. It also needs to be stated that the title of THIS version is in some dispute. All of the reissues of it on CD, as well as on Spotify, iTunes, and even National’s own discography states it is called That’s When It Really Hurts, but the original label itself reads That’s What Really Hurts, as does National records ads for the release at the time, and that’s also what Turner himself sings in the lyrics, so we’ll go with Joe, but just in case anyone is inclined to dispute it that’s the skinny on the different titles. Boring minutiae aside, the record itself is what we’re here for and unfortunately, as befitting the timing of its creation, it finds itself stuck between two worlds. The horn section – as we keep stating is a common problem still at this stage of rock – is completely out of step, not just with the rock sounds that were emerging, which you might expect, but even more so with Turner himself on the track. They’re never in sync, the band sounding as if they’re determined to sabotage his shot at glory and drag Turner back into the past and into irrelevancy. It’s not that their playing is sedate as is often the case in this early rock era, far from it in fact. They play spryly enough, but WHAT they’re playing is indulgent and in no way contributes to the song they’ve been enlisted to propel. If ever there was a case of a record sounding like a radio tuned to two different stations this is it and because of that unfortunate clash between the band and the singer the record has no chance of working. But if you could twist the knob ever so slightly, honing in on Turner as he wrestles in the studio with unsympathetic backing, you’d hear him laying down the tentative, admittedly rough, blueprint for much of what followed in rock. The connection to a later classic of his obviously makes it all the more apparent, but even beyond that what Turner himself brings to the table is already perfectly situated for rock’s aesthetic approach. His voice is as strong as ever, his vaunted projection is fully intact, he knows how to sell the brash lyrics with great gusto, but as the song goes along and the musicians wander aimlessly in the dark, the drunken sax solos being particularly grating, Joe sounds increasingly bewildered and frustrated with what’s happening around him. Things pick up a bit with the guitar solo, rather muted though it may be, but then as he re-enters so too do the horns, playing a bizarre staccato-like riff, almost like they’re intentionally prodding Joe for laughs, hoping to make him crack up or break down, take your pick. In the end you wish he’d have turned around, grabbed the closest guy with a horn and wrapped it around his scrawny neck as the others fled for their lives from the studio. Alas, violence wasn’t in Joe’s nature apparently and so he’s pulled deeper into the morass until he doesn’t know which way is up and the whole thing disintegrates into organized confusion. After such a long wait to finally meet Joe That’s What Really Hurts is a bit of a disappointment to say the least. But fear not, of all the guests from the parties held during rock’s first year it’d be Turner who’d wind up not only bringing the best, and the most, gifts, but who would stay at the party longer than anyone else. The horn players were shown the door before they cut the cake and weren’t invited back. 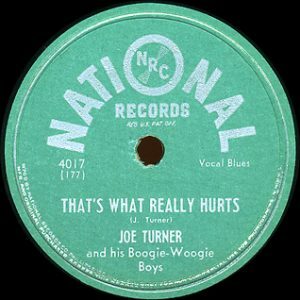 Leave a reply on "Big Joe Turner: “That’s What Really Hurts”"